HALBAN For more than 30 years, Prof. Dr. Michael Jansen, the founding Rector of the German University of Technology in Oman (GUtech) and currently the Director of the Indian Ocean Research Center at GUtech and UNESCO Senior Expert, has been working along with an international team of researchers from Germany, Italy and the US on excavating the sites of Mohenjo-Daro (“The Hill of the Dead”). “Our recent discoveries have proved that the site is at least two times larger than to be seen today. The major part of it has been covered in the past 4500 years by the siltation process of the Indus. New research, which will be carried out from February 2018 onwards by myself and my team will open a new chapter of research for this civilization and will prove further evidence for the real size of the city,” said Prof. Jansen. Located in the Indus Valley, in the province of Sindh, Pakistan, it is one of the largest Bronze Age cities of the third Millennium BC. “The Indus Civilization was the most widespread of all known early civilizations, and of the more than 2000 identified settlements so far, Mohenjo-Daro is the largest one,” said Prof. Michael Jansen during a presentation about his research and work on the archaeological site that was followed by a German Television documentary (produced by arte/ZDF). According to Prof. Jansen, there have been many trade relations between the Indus valley and the Gulf countries including the Sultanate of Oman. In 1979 Mohenjo-Daro was placed as one of the first archaeological sites internationally on the UNESCO World Heritage List. The city was discovered by archaeologists around 100 years ago. Only 10% of the city has been excavated so far. “It appears that the city was located within a large settlement network. It was an administrative, managerial center and without major production zones. After a slow degrading, the city was finally abandoned around 1,500 BC,” said Prof. Jansen while adding: “We are fascinated by the simplicity of the city and its civilisation.”. The city of Mohenjo-Daro was solely built of pre-fabricated mud and burnt bricks of today´s standards. All water needed was supplied by more than 600 wells within the urban context, the sewage system comprised of a systematic drainage system, contrary to the other contemporary ancient civilizations of Mesopotamia and Egypt, where the fresh water needed was taken from the nearby rivers. The research of Prof Jansen and his team from RWTH Aachen University (GUtech’s German partner-university), has shown that Mohenjo-Daro probably was once the first pre-planned city of the world, built on artificial platforms to protect the inhabitants against the annual summer inundation of the river Indus. According to Prof. Jansen, since the damming of the river Indus in the 19th century and since the beginning of artificial irrigation in 1930 of an area covering almost the whole Lower Sindh, Mohenjo-Daro is under enormous threat of destruction by salts rising through the irrigation process to the surface. From 1979 to 1997 UNESCO launched its largest campaign so far for the safeguarding of Mohenjo-Daro. Within this large program Prof. Jansen and his team were engaged to develop a conservation method to save the more than 40.000 meters of excavated city brick walls. Finally it was decided to cover the original brick fabric with a thin layer of mud. Consequently, the salts can crystallize without further destroying the original walls and the original bricks. Regular maintenance and monitoring of the ruins and the site are a primary need. An ambitious preservation scheme has been underway for many years. The tribe of Mohanas, river nomads, living till today on boats on the Indus river close by Mohenjo-Daro and on the near-by Manchhar Lake may be a remaining part of the ancient population. Until now little is known about the script of the Indus civilization. Prof. Jansen is planning to establish an international society for the promotion of Mohenjo-Daro, the probably largest city of mankind in the third millennium BC. The Research Center Indian Ocean at GUtech will be an essential partner to reach this goal. © Text: GUtech/Manuela Gutberlet; Photo: OES / Michaela Liehner-Jansen. HALBAN Prof Dr. Aydin Azizi, Assistant Professor at the Department of Mechanical Engineering at GUtech has received the National Research Award from The Research Council (TRC) for his published research in the field of Mechatronics. The research was awarded as the best research work in the energy and industry sector for the year 2017. In his research conducted in the past three years and recently published in an international, Q1 ranked, peer-reviewed engineering journal, Prof. Aydin has introduced a novel Hybrid Artificial Intelligence Algorithm to analyse and calculate the optimized number and the position of RFID antennas needed to be deployed in the network in order to track and identify materials, products, and even live subjects. “Artificial intelligence includes the design of intelligent agents to solve real-world every-day problems, and nowadays it is in high demand of the most companies. My research can be applied in the different sectors such as telecommunication, transportation, energy, industry and even health care, e.g. through network of tracking identification cards, pattern recognition of rescue robots and etc.,” he said. His results show the proposed new algorithm, a so-called “Hybrid Artificial Intelligence Algorithm”, which is a high performance and accurate technique to solve complex problems. According to Prof. Aydin applications of Artificial Intelligence are currently researched in Oman whereas in Europe they are already applied in many fields, e.g. in the automation industry. Prof. Aydin Azizi has been working at GUtech in the past three years. He is the research focal point of the Research Council of Oman (TRC). His main research interest is Mechatronics, focusing on developing and investigating different Artificial Intelligent Techniques to model, control and optimize complex nonlinear systems for industrial applications, e.g. in telecommunications. Prof. Aydin holds a BSc in Mechanical Engineering of Urmia University in Iran, an MSc in Mechatronics of Sharif University of Technology in Iran and a PhD in Mechanical Engineering of the Eastern Mediterranean University in Cyprus. HALBAN To boost the solar energy sector and training of Omanis in the Sultanate of Oman, The German University of Technology in Oman (GUtech) has signed a Memorandum of Understanding (MoU) with Hussam Technology Company LLC (HTC) and Three Pillars Consulting (TPC). 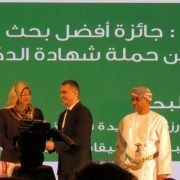 The goal of this unique cooperation is to establish the first ‘Solar Training Programme’ in Oman on GUtech’s campus in Halban, just outside of Muscat. This Training Programme is being sponsored by BP Oman’s latest round of Social Investment Programme, and was awarded to and implemented by HTC, along with their partners TPC and Solar Energy International (SEI). Recently a number of projects and policies have been initiated in response to the role that solar energy will play in the Sultanate of Oman. “We are very glad to participate in the founding of a special Solar Training Programme at GUtech” said Prof. Dr. Ing. Michael Modigell, Rector of GUtech. BP Oman will sponsor the supply of the outdoor training facilities and along with HTC, TPC and SEI a total of 3 training classes will be delivered per year. GUtech has agreed to provide the indoor classroom and outdoor training spaces required for such a programme, over the course of an initial 3-year period. The outdoor space will be roughly 400 m2 and provide the capacity to train upwards of 30 students per session. “Germany has the largest installed solar power generation capacity per capita” said Prof. Dr. Ing. Modigell. He went on to say that “[GUtech] would like to capitalize on the even greater amount of readily available solar resources here in Oman and are looking forward to helping facilitate this state-of-the art Solar Training Programme.” The training curriculum developed by SEI has been used internationally to prepare interested persons who want the work in the photovoltaic sector. It has been further localised with the help of HTC and TPC to meet Oman’s codes and standards. Enrolment into the Programme is open for all but particularly for interested Omani residents. “We expect a wide spectrum of trainees to attend this course, from fresh graduates, to mid-career engineers, consultants and others who might want to participate in this exciting distributed energy generation sector that we see provide great opportunity for local Omani entrepreneurship and employment” said Dr. Firas Al-Abduwani, CEO of HTC. As well, the students and staff at GUtech will also benefit from the immediate access to the facilities of the Training Programme, which they intend to also use for hands-on academic purposes. GUtech offers several BEng and BSc programmes in which their participation in this Programme will be a great benefit to their students. 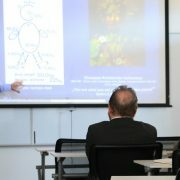 “In this special training programme, students in Environmental Engineering as well as in Process Engineering, for example, will be able to use and improve their knowledge directly in a hands-on setting using hardware and systems they would see in the real world,” said Prof. Dr. Michael Modigell. The benefits of this have already started to be seen, as several groups of students from the Urban Planning and Development department, under the instruction of Professor Alexander Kader and Lecturer Petrit Pasha, just participated in a design competition to create the first iteration of the outdoor training facilities. “The students really impressed us with both their design talents and skills but also their motivation and understanding of how important and unique this programme is for Oman” said Michael Tsang, CEO of Three Pillars Consulting. The winner of the design competition will help in the final design of the training facility, which is expected to be built by February 2018. “This is just the start of what we think will be a very fruitful and valuable collaboration”, reflected GUtech’s Ali Humairi, who has been working closely with HTC and TPC on the development of this agreement. One of the main courses that we are offering our engineering students is on the topic of renewable energy and energy efficiency. Having such professional training programme may motivate the students and give them the opportunity to run some experiments. “I am more than happy to see that the Faculty of Engineering and Computer Science is hosting and being part of the first professional solar training programme which may bring the awareness of solar technology in Oman”, said Najah Al Mhanna, Dean of Faculty of Engineering and computer Science. “In the beginning of the project, the biggest motivation to implement this project is that this project meets the GUtech Vision and Mission to serve the community in Oman”, said Mr. Ali Al-Humairi, Lecturer in the Computer Science Department and the CSR Focal Point. 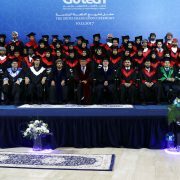 HALBAN The German University of Technology in Oman (GUtech) has held its 6th Graduation Ceremony on Monday, 10th December. A total of 115 students graduated this year in BSc, BEng and MSc programmes. The majority of the GUtech graduates are female and Omani. 7 students graduated in MSc Petroleum Geosciences, 57 graduated in BEng Engineering, 17 students graduated in BSc Applied Geosciences, 5 students graduated in BSc Computer Sciences and 29 students in BSc Urban Planning and Architectural Design. The ceremony was held in the presence of members of the Majlis Al Dowla and Majlis Al Shura as well as members of the Board of Governors of GUtech and other dignitaries, GUtech staff members and families of the GUtech graduates. “We are proud of our graduates. It is a unique day for you and for GUtech. You have been fighting and you may have been disappointed throughout the past years, but you made it and concluded your studies. You can be proud of yourself,” said the Rector of GUtech, Prof. Dr. Ing Michael Modigell. This year several BSc and MSc graduates have conducted their Bachelor thesis in Engineering, Geosciences and Urban Planning and Architectural Design at partner-universities in Germany, RWTH Aachen and University of Erlangen, or in Italy, at the University of Brescia. 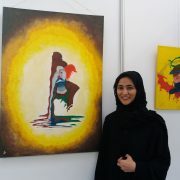 Shamsa Al Brashdi is a graduate in BSc Applied Geosciences. She is now pursuing her MSc studies in Applied Petroleum Geoscience in Edinburgh, Scotland at Heriot Watt University. The study-programme is sponsored by Petroleum Development Oman (PDO). “Geoscience was not my first passion. However, the idea of learning your own planet and what it hides in the subsurface attracted me. Starting my first year, I started doubting if this programme was suitable for me or not. I can never forget when one of the professors said this sentence: ‘’Each rock has its own story’’. This sentence made me love what I’m studying, and this day marked the day that I was sure that this is what I wanted to do,” she said. As a BSc thesis Shamsa studied the subsurface of late Paleocene to early Eocene carbonate rocks of Ras Al Hamra- BH1, BH2 and BH4. It is a shallow core analysis of Ras Al Hamra. Shamsa conducted her internship at Petroleum development of Oman (PDO) in the Hydrogeology department. Lanah Samarrai graduated in BEng Process Engineering: “GUtech has many facilities that encouraged me for studying. They include a comfortable atmosphere in the library, continuous help from the interns from Germany, a flexible schedule for sports activities and an international accreditation of the study-programmes. I faced also challenges like tight deadlines and an intensive timetable. Nevertheless, I am proud of its outcome. I realised that I am now better and stronger than what I thought. I learned how to organise my time carefully, transform the challenges into success, work independently and within teams. In future, I would like to conduct more internships and training programmes and then finish my postgraduate degrees,” she said. Through the international IAESTE internship exchange programme for engineers, Lanah had the unique opportunity to conduct a 3 month internship at the Engineering department of the University of Dresden (Germany) last summer. Halban The celebrations of the 10th anniversary continued with the Arts & Science Day at GUtech on Thursday 7 December. Students showcased their artwork, their scientific ideas and research projects in the amphitheatre of the university. Alanoud Al Balushi, Lamya Al Siyabi, Rehan Al Balushi and Yaman Al Hajri are studying Process Engineering at GUtech. They presented an ‘Acquaponics System’ that feeds fish with a sensor measuring the water level, the acidity and the temperature, in order to ensure the well-being of the fish. According to the students, the acquaponics system ensures a balanced life for fish and plants. “We have seen that we can develop the technical parts through an additional sensor”. Moreover, students Heba Al Kharousi, Arwa Al Salmi and Ishraq Al Hatmi, presented a small model of a hydrogen car, that has won several regional awards recently. Several interns from Germany, who are currently supporting the Department of Sciences and Maths presented the chemistry of food items. For example, the flavour of ginger is influenced by a number of compounds. The pungency of fresh ginger comes from ‘gingerol’, while the flavour comes from the compound of so-called ‘zingiberen’. Cooking ginger breaks down both compounds. HALBAN The 3rd International Symposium on Flash Floods in Wadi Systems (ISSF) entitled “Disaster Risk Reduction and Water Harvesting in the Arab Region,” concluded end of last week at the German University of Technology in Oman (GUtech) in Halban. Sessions on hydraulic simulation, water harvesting and sediment management as well as monitoring, meterology, climate change, risk assessment, risk management and hazard mitigation were held. According to the international experts in the multi-disciplinary field of flash flood management, most Arab countries have been suffering from a rise in flash floods, especially within the past ten years. Dr. Ayisha Al Khatri from the Ministry of Regional Municipalities and Water Resources (MRMWR) gave a presentation on the Hydrometic network and its role in flash floods monitoring in the Sultanate of Oman. Dr. Ayisha said that the first rain gauge was installed in Muscat in 1893 already. The first flood risk studies was initiated in 1987 already. In 1992 the ministry published the first flood risk maps, indicating areas that are located in flood areas. The hydrometic network monitors flash floods and therefore helps to project and prevent future floods in the country. 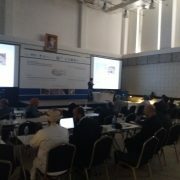 A team of researchers from Kyoto University (Japan) Dr. Tetsuya Sumi, Dr. Sameh Kantoush and Dr. Mohamed Saber, raised in their research presentation the question regarding the understanding the dramatic changes of flash floods in terms of their frequency and intensity due to climate change and how to mitigate and manage the flood water and to reduce the risk of disasters? For their research they applied water harvesting and hydrological modelling within a case study conducted in Egypt. Towards the end of the sessions, the participants of the symposium discussed a joint 5year Road Map towards establishing an international framework of guidelines for the management of flash floods in wadi systems. Short-term measures such as training, construction guidelines and a wadi flash flood textbook were discussed. The framework will also include international research projects, international guidelines regarding the management of wadis, continuous monitoring of the wadi systems, modelling of the wadi flows as well as continuous public awareness through education and health services. More than one hundred local and international experts from Japan, Egypt, Morocco, Saudi-Arabia, Jordan, Iraq and Germany besides other countries, attended the three-day symposium, that included an excursion to the Fulaij Flood Protection Dam in Sur on Thursday as well as a pre-conference training workshop on “Flow and Sediment Transport Modelling in Rivers and Wadi System using TELEMAC 2D and 3D numerical codes”. The Department of Applied Geosciences (AGEO) at GUtech organized the symposium in cooperation with the Water Resource Research Center in Kyoto (WRRC), the Global Alliance of Disaster Research Institutes (GDRAI) of the Disaster Prevention Research Institute (DPRI), Kyoto University, and the Ministry of Regional Municipalities and Water Resources (MRMWR). Moreover, the symposium is sponsored by Hölscher Wasserbau GmbH, COMSOL Inc., Al Bustan Construction as well as Gulf Lake. The organizers also wish to acknowledge all support received from the Association for Hydro-Environment Engineering and Research (IAHR). 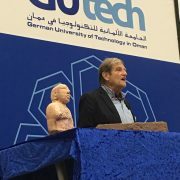 HALBAN The celebrations of the 10th anniversary of the German University of Technology in Oman (GUtech) kicked off on Wednesday, 6 December with the Omani-German Day celebrated under the auspices of H.E. Thomas Schneider, Ambassador of the Federal Republic of Germany to the Sultanate of Oman. “This is an occasion of joy and pride,” said the German Ambassador in his speech held in the amphitheatre of the university. According to the Ambassador German diplomatic relations between the Sultanate and Germany began in 1972. The Ambassador stressed that German education is not a commercial good, while referring to the vision of the German academic Alexander von Humboldt whereby “universities should enable the students to become independent thinkers” and education should be affordable and accessible for every student. German universities rank among the best in the world and are leading research institutions in many fields. GUtech is affiliated with RWTH Aachen University and was established in 2007 in Muscat. “GUtech will always be a flagship for German-Omani relations,” said the Ambassador. Further highlights of the Oman-German Day were the distribution of scholarships awarded by the German Academic Exchange Service (DAAD) to 19 international and Omani GUtech students. “The scholarship encourages me to work even harder during my studies. In future I would like to study in Germany and maybe conduct my BSc thesis at a German university,” said Majda Mohammed, who is studying BSc International Business and Service Management (IBSM) in the 2nd year at GUtech. The distribution of scholarships was followed by a classical musical performance of German composers by four members of the Royal Symphony Orchestra. Towards the end of the evening, the first episode of the documentary film ‘Sons of Sinbad’ about the rich seafaring history of Oman was shown in the amphitheatre of the university. The second and third episode of the documentary will be shown on Thursday, 7 December and on Monday 11 December. To book a seat please contact www.gutecheventbrite.com. On Thursday, 7 December the Arts and Science Day will be held on campus and on Monday, 11 December a special GUtech Open Day, that will focus on various activities for families and all age groups will be held the entire day at GUtech. The 6th graduation ceremony will be held on Sunday, 10 December and on the 12th December the 5th anniversary of the visit of H.M will be celebrated in the evening. Both events are on invitation only. 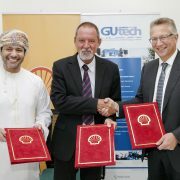 MUSCAT Shell Oman and the German University of Technology in Oman (GUtech) inked an agreement that will allow a student team from GUtech to participate in the eighth round of Shell Eco-marathon Asia taking place in early 2018. This will be the fourth time for Team Megalodon from GUtech to participate in Shell Eco-marathon with an energy-efficient vehicle in the diesel prototype category. They will be racing alongside students from universities, colleges and technical institutes across 16 other countries from across Asia, Middle East and Africa. “I would like to express my gratitude to Shell Oman, who will financially support our GUtech team during the Eco-marathon 2018. GUtech teams have been participating in the Shell Eco-marathon since 2015. We have witnessed the impact of this international initiative on our students, who work long hour, trying to plan and solve engineering problems in their free time. 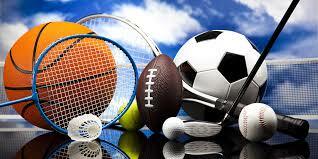 During the competition, they must work and manage the team and their resources, it is a huge task for young students. The Shell Eco marathon provides an immense value for young engineers, who work in a team and manage their entire project in a timely and precise manner. The new GUtech team has already started the planning of the project and the design of the next eco-friendly car. I wish them innovative ideas and a lot of success for the coming months and the competition in March next year,” stated Prof. Dr. Ing. 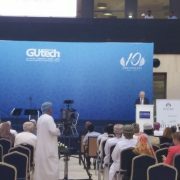 Michael Modigell, Rector of GUtech. Shell Eco-marathon Asia 2018 will see 24 On-Track awards with prize money of US $2,000 for Winners in both Prototype and Urban Concept categories. In addition, teams will also be competing for five Off-Track awards: Communications, Vehicle Design, Technical Innovation, Safety and Perseverance and Spirit of the Event.